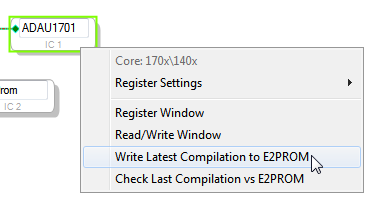 Here is a step-by-step guide to self-booting the EVAL-ADAU1701MINIZ, which is an evaluation board for the ADAU1701, ADAU1702, and ADAU1401A SigmaDSPs. First, orient the board so that you can read the reference designators (with DC power jack at the upper left corner of the board). 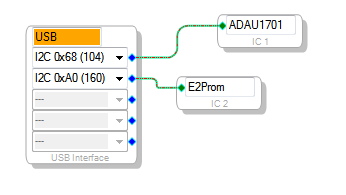 Next, load your project in SigmaStudio and make sure both an ADAU1701/ADAU1702/ADAU1401 IC and an E2Prom IC are connected to the USBi.